A special junior clinic kicked off the Michigan Open Championship at Grand Traverse Resort and Spa this past weekend. The 101st Michigan Open Championship festivities kicked off with five of some of the most decorated Michigan golfers helping with a special Michigan Open Junior Clinic on Sunday, June 10, 2018 on The Bear at Grand Traverse Resort and Spa in Acme, Michigan. The clinic, hosted by the Grand Traverse Resort and Spa in collaboration with the Traverse City Junior Golf Association, or TCJGA, and the Michigan PGA, was held on the practice range this past Sunday afternoon. 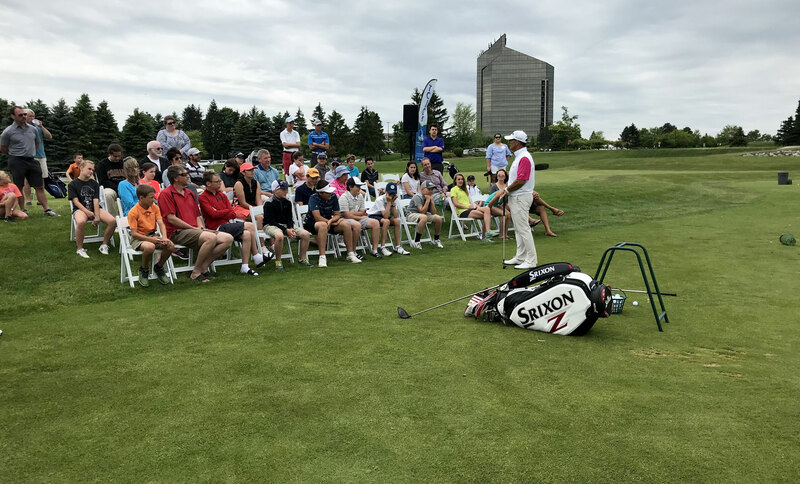 The session focused on how professionals prepare and practice for tournament settings, and featured a question-and-answer portion as well as demonstrations by the Michigan PGA Professionals. Michigan Golf Hall of Fame golfers—Scott Hebert, Tom Gillis, Jeff Roth, and Brian Cairns—were joined by Doug LaBelle, who is a former PGA Tour golfer and likely candidate for the Hall of Fame, for the special junior golf clinic. Scott Wilson, PGA professional at Bay Meadows Learning Center and TCJGA lead instructor, directed the clinic, while Todd Hursey, executive director of TCJGA and coach of the Suttons Bay High School team, was the master of ceremonies. The Michigan PGA Professionals who participated as part of the clinic—Hebert, Gillis, Roth, Cairns, and LaBelle—are competing this week as part of the 156-golfer field playing for the Michigan Open Championship. All five of the professionals have played in more than one of the golf’s major championships with the best players in the world. Hebert, a six-time Michigan Open winner, is currently the head golf professional at Traverse City Golf & Country Club. Gillis, a two-time Michigan Open winner, is a long-time touring professional taking a run at the PGA Tour Champions at age 50. 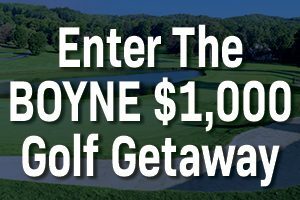 Roth, a two-time Open winner, recently returned to Michigan to work for Boyne Golf. Cairns is an instructor at Fox Hills Golf & Learning Center in Plymouth, and just recently played in the Senior PGA Championship in Benton Harbor. LaBelle, just a few years ago returned to Mt. Pleasant after playing professional golf around the world, including five years on the PGA Tour. The Bear was previously home to the Michigan Open Championship from 1985 through 2008 and was designed by Jack Nicklaus. It features terraced fairways, tiered greens, deep grassy roughs, mounds and deep pot bunkers. It stretches up to 7,078 yards from the championship tees, plays around four lakes, comprises nearly 10 holes with water hazards, and has just one hole without bunkers: the sixth hole. The tournament is open for public viewing at no charge, but spectators are asked to follow standard golf course etiquette and dress codes. The 2018 championship is being presented by Yamaha Golf Cars Plus and MercyElite Sports Performance with additional support from Pepsi and Traverse City Tourism. Grand Traverse Resort and Spa is located near Traverse City in Acme, Michigan, along Lake Michigan’s Grand Traverse Bay. The 900-acre property is one of the Midwest’s finest year-round resorts featuring nearly 600 guest rooms, 54 holes of championship golf with courses designed by Jack Nicklaus and Gary Player, a full-service spa, and upscale dining and shopping.